Each hole at Radley Run now has additional tees closer to the green designated specifically for kids. Kids of all ages now can enjoy the Radley Run Country Club Golf Course, thanks to new, closer tees for kids. BIRMINGHAM —Young golfers now get their own tees and a better chance to have a fun day on the links, thanks to some new improvements to the Radley Run Country Club Golf Course. The PGA of America and U.S. Kids Golf launched the PGA Family Course Program, a nationwide initiative that makes golf more fun for families, regardless of age and ability. Young players new to game are encouraged by our beginner-friendly short course within the challenging Radley Run golf facility. As theirgame progresses the child determines when they are ready to advance from the Blue Markers to the Gold Markers and ultimately to one of Radley’s four sets of tees that their parents enjoy. Now parents and their smaller children have the ability to play together faster, to shoot similar scores, and have more comparable club selections thus learning the game faster. 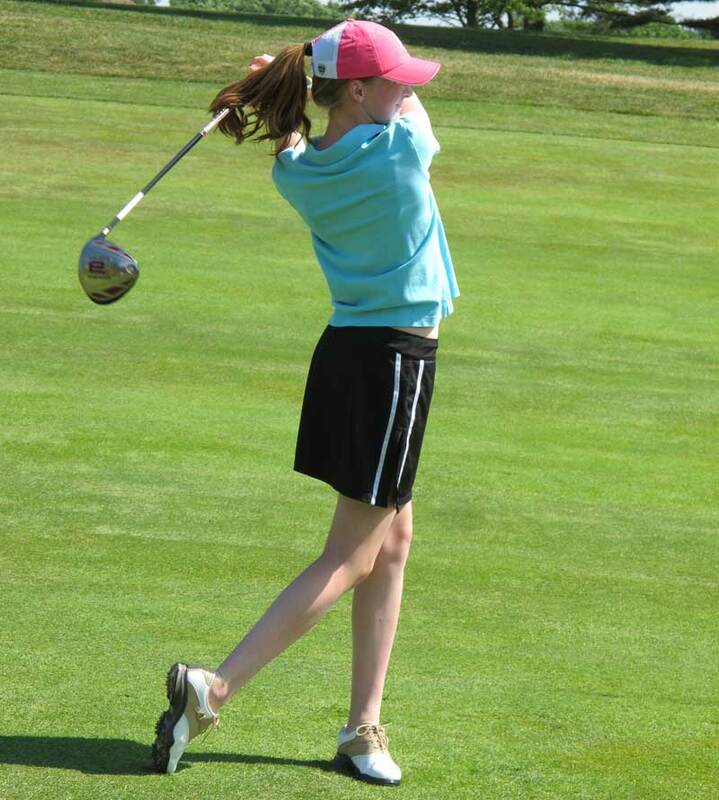 We have seen an increase in parent/child play with the new tees and even more when school gets out for the summer. Radley’s Blue PGA level 1 markers and the Gold PGA level 2 markers are identified by a marker off to the side of the fairway and a corresponding teeing marker in each fairway. The Level 1 Blue Markers par 3 yardage is between 45-85 yards, the par 4s are 85-135 yards and the par 5s come in at 135-195 yards, bringing the total 18 hole yardage to about 2200 yards. As the young golfers get better and more confident moving up to the Gold Markers lengthens the course to a total of approximately 3800 yards. Special scorecards are available for the new Family Course yardage at Radley. Kate Evanko (13) demonstrates why she is becoming quite an excellent golfer. Now when the children at Radley say, “Let’s go play a few holes Mom and Dad,” their parents really have a match on their hands.